At our June meeting after Margie Hancock called the meeting to order, Jean Martin gave the thought for the day. This was Treasure Hunt day and there were tables chock-full of “treasures” that some members had purged from their closets for other quilters to buy. Tables were set up all around the room, and these didn’t hold it all. 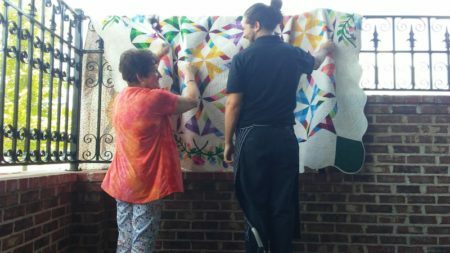 Our member Myrna Jones is moving away and she generously donated her supplies and fabric to the guild. There was enough of this that the overflow will be saved for the Boutique at the show. Thanks, Myrna! And thanks to Margie Hancock and her husband Wayne for several days of picking up, measuring, pricing, and storing all of it. Sorry I did not get a picture of all those full tables! 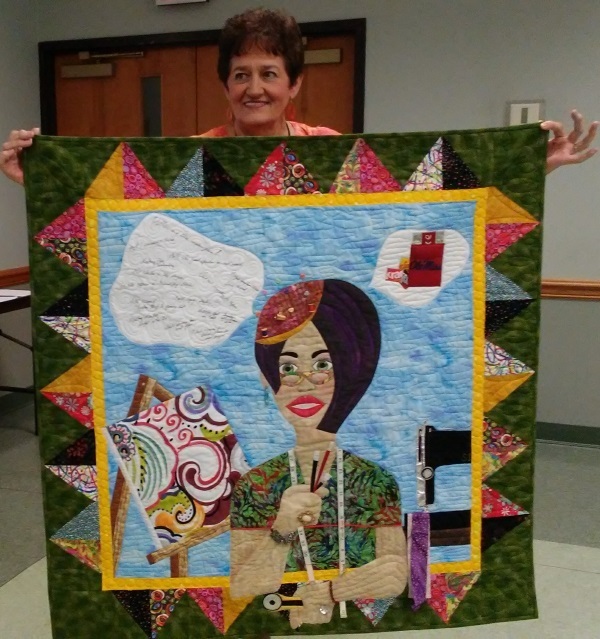 Betty Reid described quilt show duties to acquaint members with how they can work at the quilt show. She reminded everyone that they need to work at least four hours during the show or else pay admission. See the June newsletter for more about the duties. 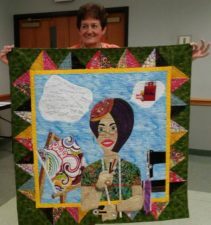 Mary Nell Magee made a motion that the two Best of Show quilts be made by no more than two people and that the Best of Show-Small be no larger than 69” on any side. After discussion, the motion passed. Shirley Wiltshire reminded us to be bringing items for the Boutique, including scraps. Shoppers fill Ziploc bags with these scraps, making this scrap table one of the most popular areas at the show. Anne Hindmarch was the winner of the Friendship block drawing. 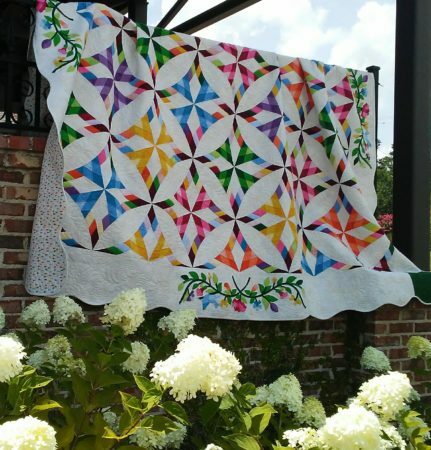 The UFO Challenge quilts were shown and recorded; UFO #3 will be due at the August meeting. Remember the Parade of Children’s Quilts for the July meeting. Mary Nell will have representatives of several agencies present to receive our finished quilts. If you didn’t make reservations for your Stonewall Barbeque lunch, contact Missy Lee. Dianne McLendon brought her finished self-portrait that she began in the Mary Lou Weidman class. She said the thought bubble contains whatever was going through her head while she stitched this. Charitable activities: Joe Bingham topped his previous record of donations by bringing 45 CQs in today. We also received 20 walker totes, 6 catheter bag covers, 6 preemie blankets, 10 mother pads, and 50 pillows. If you can solicit an ad for our show catalog, send the money and necessary information to Betty Bingham, who will then send to Linda Flanders for the layout. Thanks to Betty for taking on this job. This is an important part of how we finance our show. Be sure to sell your raffle tickets. This is our major fund raiser, essential for us to put on a show. Kaye Christensen has more tickets, so get in touch with her for more in case you run out. Posters will be available at the July meeting for anyone to take to display. Thanks to the Patio 44 waiter who helped us get pictures for the posters.